Google, the world's most popular Internet search engine, marked the last day of 2013 and the first day of 2014 with an animated doodle. The search engine posted the doodle on its homepage on December 31, 2013. The doodle featured the numbers 2, 0, 1, 3 and 4. While the numbers 2, 0, 1, 3 were dancing above a flashing dance floor, the number 4 stood at a side waiting for its turn to replace the number 3. At the strike of midnight ushering in the New Year, the number 4 replaced the number 3, welcoming the year 2014. The number 3 moved the place where the number 4 was earlier waiting for its turn. The number 3 was sweating and panting. 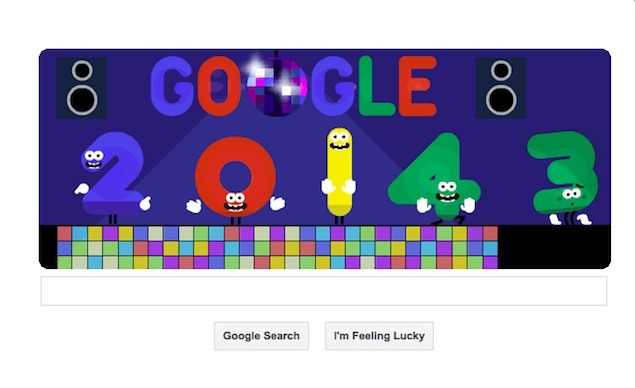 The doodle also featured two thumping speakers above the numbers. The speakers signified loud music being played to celebrate the New Year. The word `Google' was written between the two speakers, with a revolving glitter ball standing for the second `O'. It was not the first time that Google posted a doodle on its homepage. The Mountain View-based company often post interactive doodles to mark special days and event, such as a festival or the birth anniversary of a great personality.